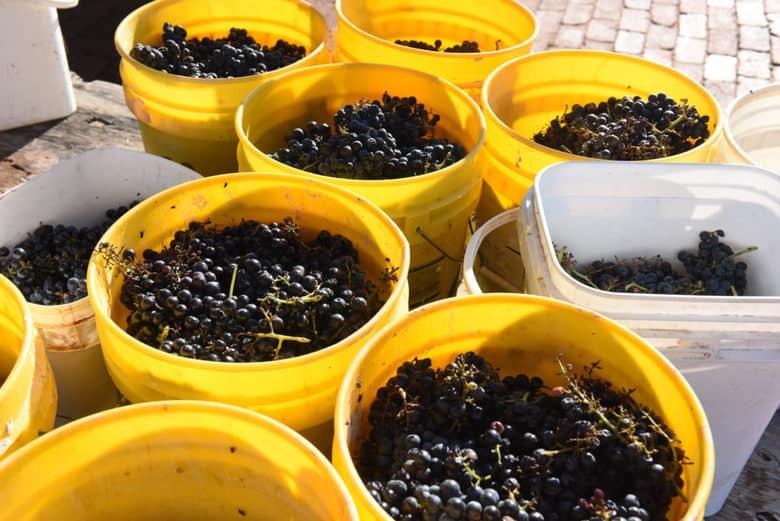 Well, harvest is over but there are always grapes left to glean! Because of the way our vine rows are set up, the last vine on the row does not get harvested by the Pellenc grape harvester. Now, some might say that we did that on purpose to make sure we have grapes for making wine! We really didn’t but, it has served us well. You can see from the photo above buckets that are full of Aglianico and Montepulciano grapes. 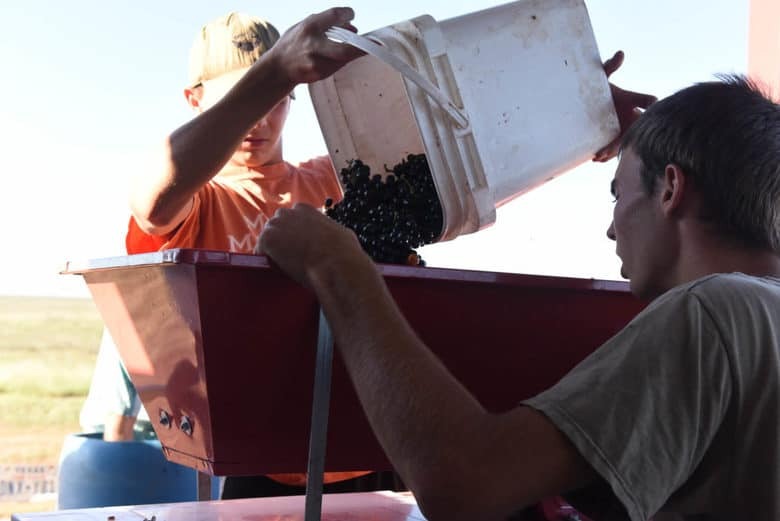 Plus, we also had two 55 gallon drums filled with grapes! We plan to start our own winery in a couple of years but for now, we enjoy making wine for our own enjoyment and to give as gifts. With our own winery in mind, we purchased the crusher/de-stemmer that you see below. It makes quick work of crushing the grapes. The crusher/de-stemmer crushes the grapes to release the juice at the same time separating the stems (rakus) from the berries. 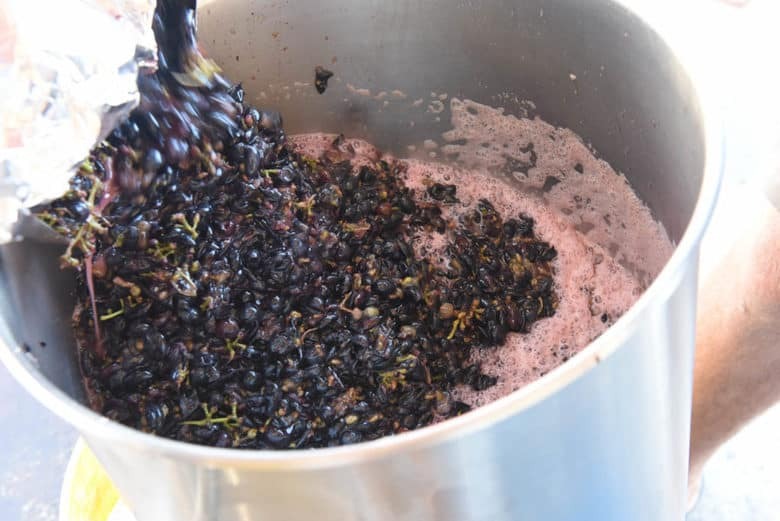 In making wine, flavors come from the juice, the skins of the berries and the stems. 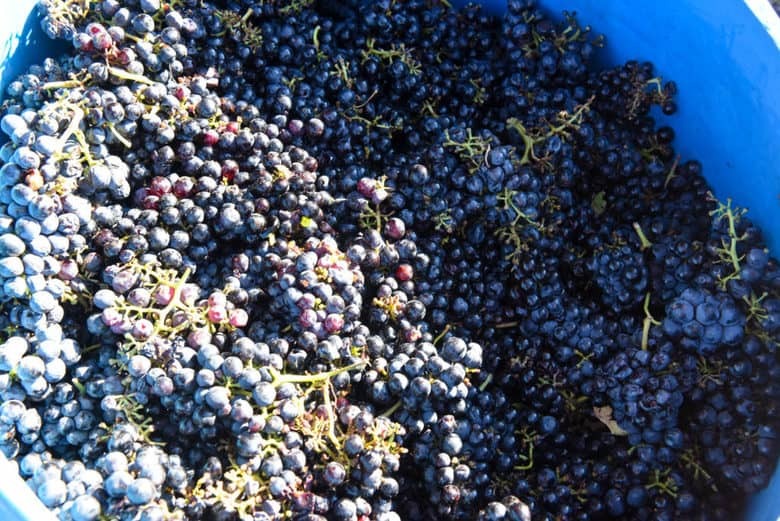 The skins yield a “good” flavor and color for the red wines. In making white wine, however, you want to separate the skins and stems as quickly as possible. In making wine, whether red or white, the stems give a bitter taste so it is important to separate them from the fruit as soon as possible. They can also cause an off color that is not desirable in white wines. So, how does the crusher/de-stemmer work? The grapes are poured into the bin on top. I forgot to get a picture but, there is an auger in the bin that works to move the grapes through into the crusher. 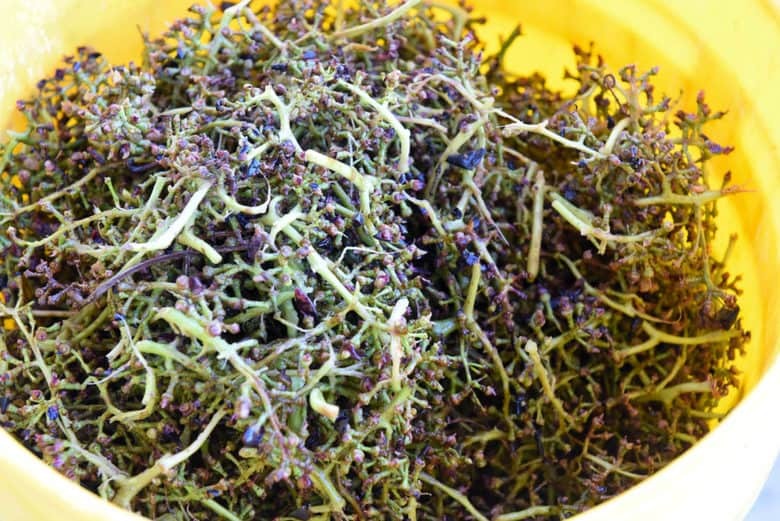 The crushed grapes come out the bottom of the shoot. There are still a few stems in them but not enough to worry about. Not all the juice is extracted at this point and it is like a thick soup. Below you can see the stems that are removed by the crusher/de-stemmer. By the time we are done, there are several buckets of stems that the cows get to enjoy! 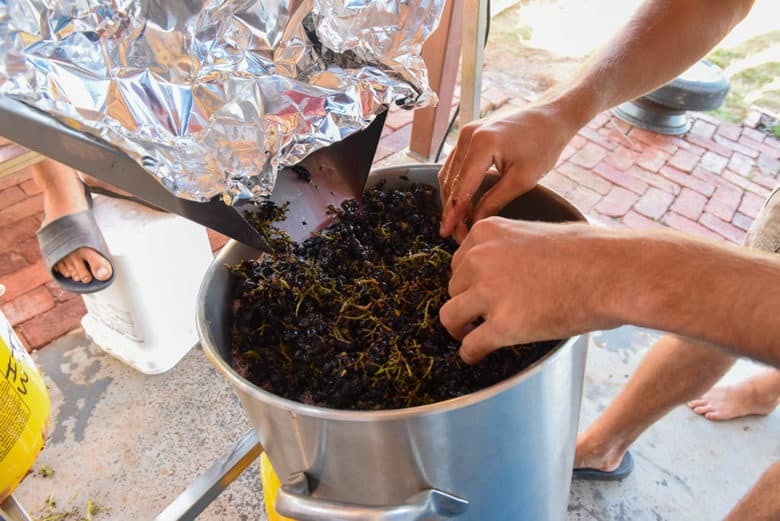 Once all the grapes go through the crusher/de-stemmer, they are placed into two 55 gallon drums and yeast is added for the fermentation process. When fermentation is finished, the next step to making wine will be pressing the grapes. 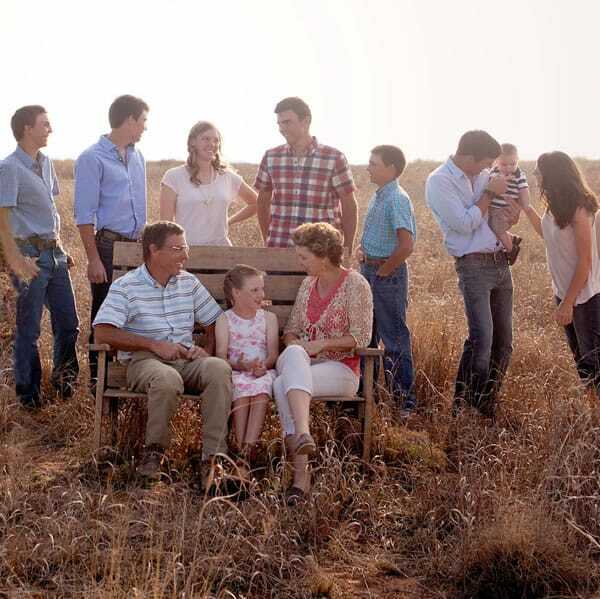 As you can see from the pictures, making wine is a family affair and lots of fun for all. By the end of the day, everyone is sticky and full of grapes.